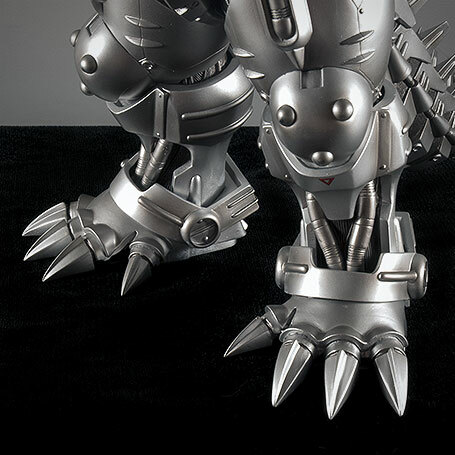 The third incarnation of Mechagodzilla, Kiryu (Machine Dragon), is a shiny, giant mecha built around the original Godzilla’s bones which first appeared in “Godzilla Against Mechagodzilla” (2002) and again in “Godzilla x Mothra x Mechagodzilla: Tokyo SOS” (2003). 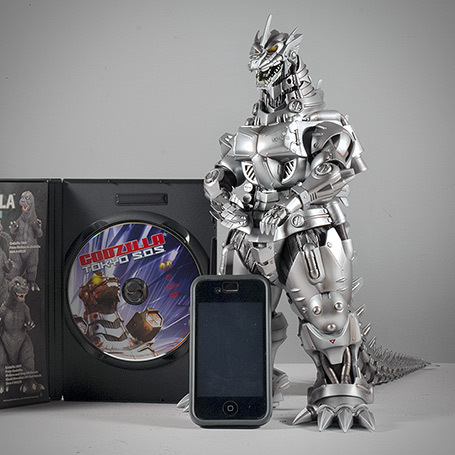 A while back, X-Plus released the 2002 version of Kiryu as a Real Master Series resin statue which was pricey and fragile. 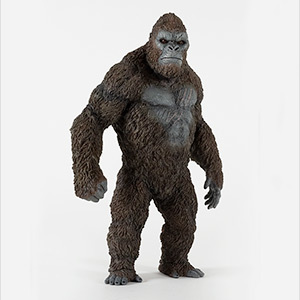 I used to daydream of a re-release of this figure in vinyl. And then, just as I had started to forget, X-Plus came through and announced a vinyl release of the 2003 version! This release wound up being delayed and the usual month long stretch of anticipation was doubled. But now (cue heavenly-sounding chorus), the X-Plus Kiryu 2003 has finally arrived. 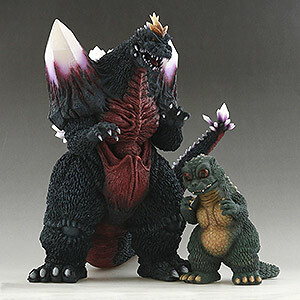 NOTE: This review is for the standard version of the new X-Plus Kiryu 2003 Vinyl Figure. While I do like the backpack and arm gear on the Ric Boy exclusive version, I was under the impression that it was not detachable. And since I had to choose one, I chose the standard version because that’s how we see Kiryu most of the time and my personal preference. See Rich Eso’s video review to see that version (link below). 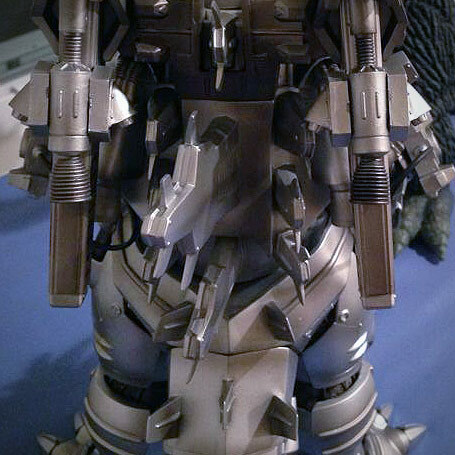 And now feast your eyes upon Mechagodzilla 3… a.k.a. Formula 3 Machine Dragon… a.k.a. Kiryu. 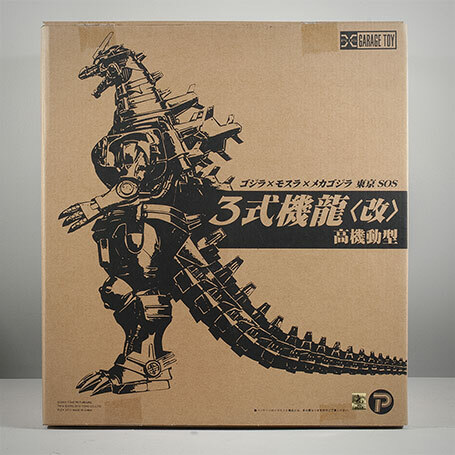 For some reason, the X-Plus Kiryu box does not come with the usual 30cm box art and instead looks like a re-issue or Wonderfest box. 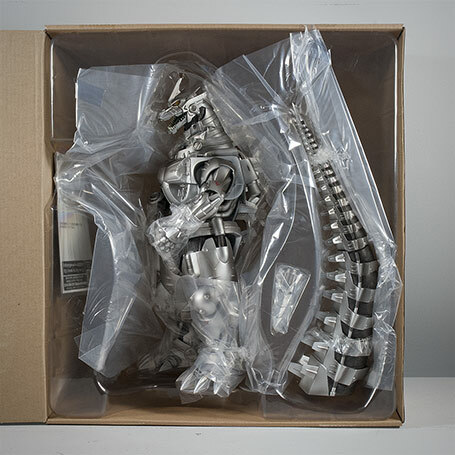 Note that this is the box for a Standard version figure. The box for a Ric Boy version will have a thin, black sticker attached below the title on the front. Inside, Kiryu is tucked into a plastic shell and held in place with several wires. If you’re not a box keeper, don’t forget to pull out the extra Drill Hand taped into the middle of the shell! Well, this is new. 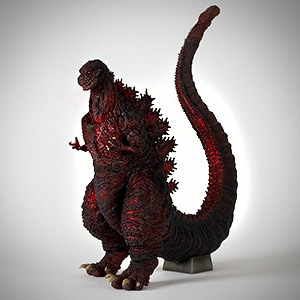 Instead of the usual hole in which a tail need be inserted, the Kiryu figure has a “nodule” (or a super scientific term would be “nubby”) which needs to be pressed into a hole at the end of the tail. In this case, I actually like it. Works good. I would suggest heating the hole in the tail (just the ridges inside the hole; not the whole end of the tail). It worked best for me when I heated it just a little. I suspect that if it were overly warm and squooshy (another scientific term) that it might work against you since the ridges wouldn’t have a pressing need to spring back into place. Just support the body, push and twist. X-plus reviewer, Rich Eso, suggests grabbing the tail end by running two or three fingers inbetween the tail’s spines when doing this. 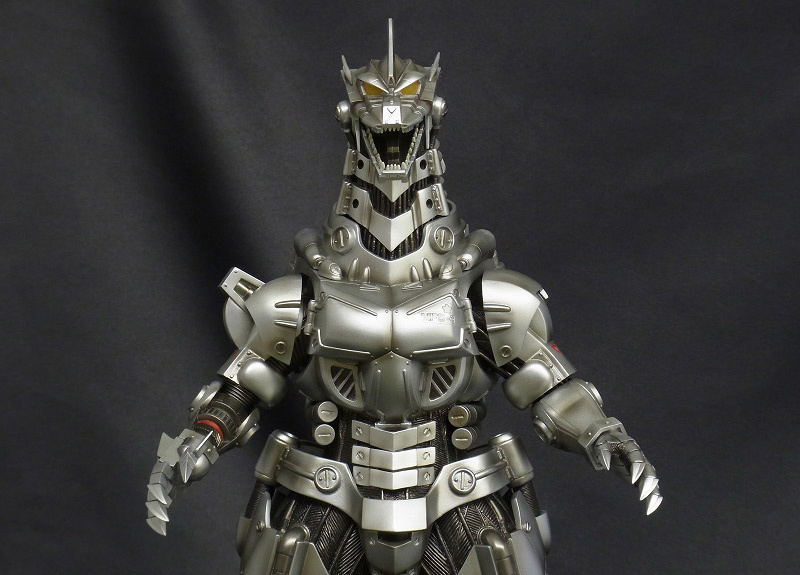 The biggest thing that worried me about a vinyl version of Kiryu was whether or not X-Plus would do a good job on all of the machine details. 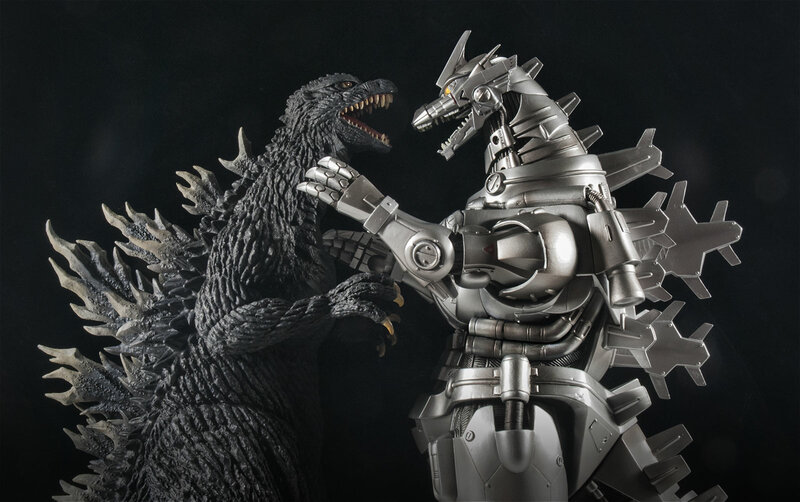 Sure, they’ve done several Showa era Mechagodzillas before, but that guy didn’t have the smooth symmetry that Mechagodzilla 2 and 3 had. It turns out that there was NOTHING to worry about. Every panel, shield, groove, pipe, piston and bolt is captured amazingly well in the X-Plus sculpt and brilliantly duplicated in soft vinyl. And since this figure is based on a robot, it must have been easier for X-Plus to make more pieces that usual — but without the lines! It’s hard to tell what was molded together and what was glued on. The eyes are molded in clear, yellow plastic with a line texture on the inside. Another fantastic touch is the individually molded black cable on the sides of the head and also at each hip. There are SIXTY-SEVEN little mini-dorsal plates on the tail alone! Throughout the body, tucked under the openings at the joints in the shiny armor is the black, fibroid innards with incredible line detail. Even the bottoms of the feet and tail are busy with detail! This is the X-Plus advantage! While I’m on the subject of hands: they’re very soft, squooshy and thin. If you pop the right hand off and look inside, you’ll see just how thin they are. Also a good time for me to mention one gotcha about this figure. The right hand is really loose and could simply fall off if brushed. (In fact the hand was detached on my figure when I first unboxed it.) 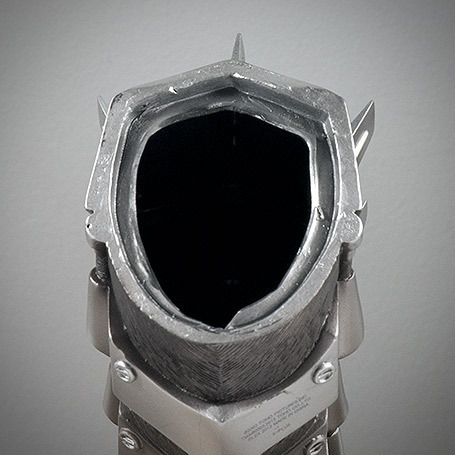 When handing or moving your Kiryu keep this in mind lest ye drop and misplace a hand. The super thinness and squooshyness of the right hand makes it difficult to insert back into the forearm; it just crumbles under the pressure. When I had to re-attach the right hand I first placed it in the refrigerator for five minutes to let it get stiff. I then heated the front of the forearm and brought them together. 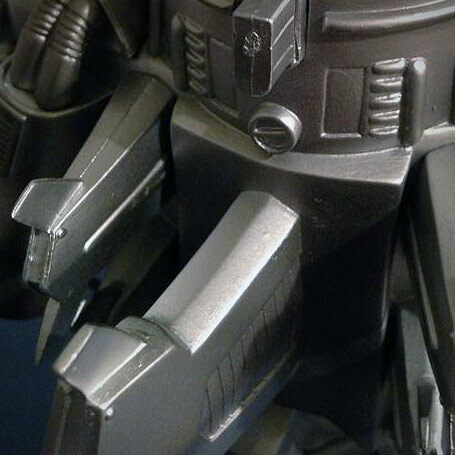 There is no need to discuss seams since lines fit right in to the robot motif. As usual, the tail is a separate piece and is further comprised of three parts. Each of these are not glued and have wiggle room, but they are not meant to be twisted or rotated. The body/tail joint is a perfect, flush fit. However, on my figure, it tends to pull away from the body on the bottom of the joint when standing on its own. Kiryu has a pretty standard pose, but it’s mostly a good one. He stands tall and straight with his feet level (no stepping motion). It seems to have its “shoulders back and chest out” and looks sturdy and formidable. Click on the photo above for a larger, hi-res view (as with all other photos on this page). The only disappointment with the standard figure is the default position of the arms. When relaxed they seem to be in a typing pose. When raised at the shoulder they look like a knitting or a getting-a-manicure pose. Either way, it’s not very kaiju-like. A far cry from the arm positions shown in the early production photos. Kiryu has articulation in the shoulders and hands. And, though stiff at first, the right elbow also rotates. I’ve noticed that my figure will allow me to rotate the left elbow. It doesn’t do this without complaining, and every time I do it I wonder if I’m about to break it. It seems X-Plus didn’t want you to rotate this joint for some reason. And I suspect they did this by making the joint inside shaped like a square. I don’t know this for sure, and I’m not about to pull it off to find out. But when I wrestle with the left forearm and rotate it, it fights back, but it does move. And after about 90 degrees it suddenly finds a new “place” it like to be. That’s what made me think of the square joint. Just to be clear: the black elbow piece does NOT move. It is GLUED to the bottom of the upper arm. If you attempt to rotate the left arm on your STANDARD Kiryu, press and hold the elbow to minimize pressure on the glue seal. Doing this doesn’t really accomplish much except making the arm straighter. I’ve decided to stop messing with it and just leave it in it’s standard position. Ignore all of this if you have the Ric Boy version which has elbows that move freely in any direction. 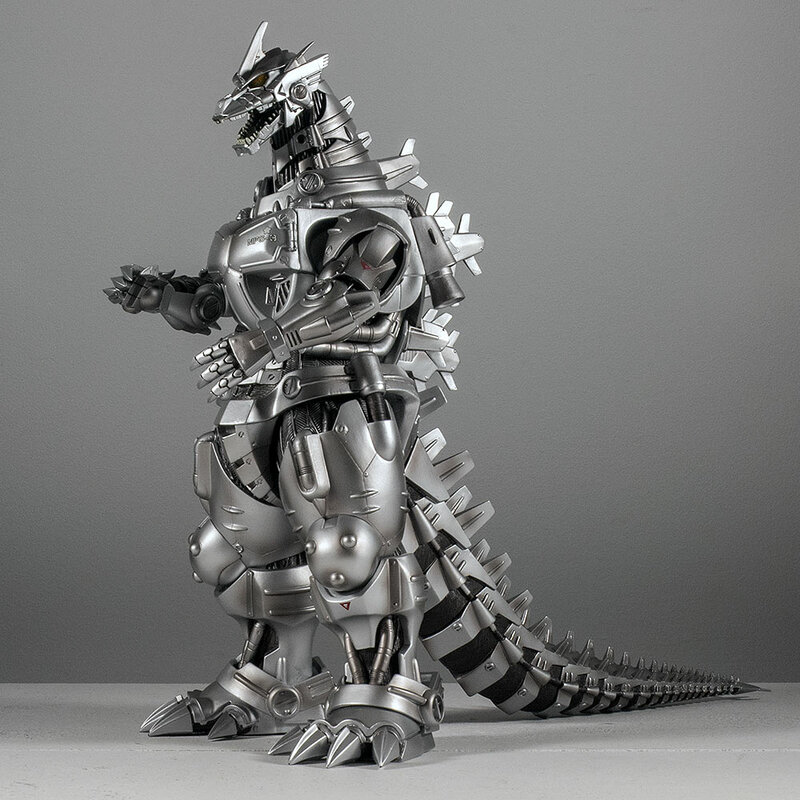 The X-Plus Kiryu vinyl is covered in a base coat of glossy silver that’s just right. It’s not overly shiny (like the S.H. 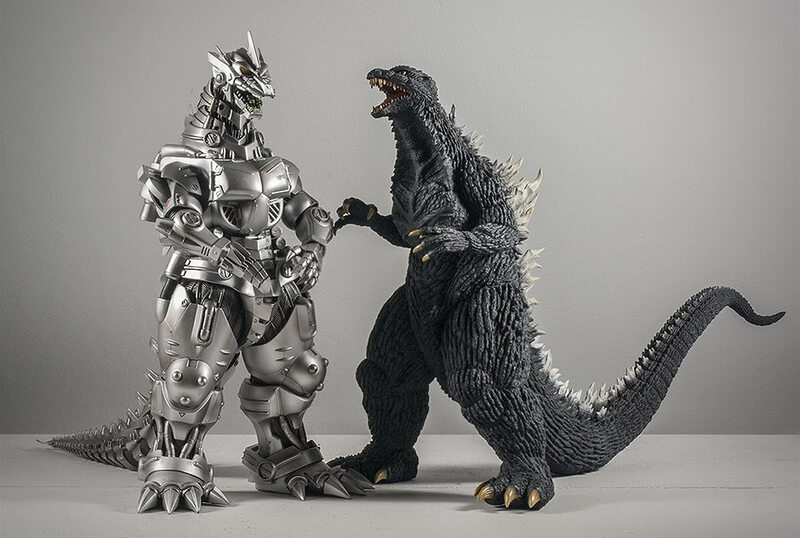 Monsterarts Kiryu) and the light loves to play off its surface with lots of speculars. They also did a fantastic job of airbrushing soft, super-subtle shadows with an ever so slight darker silver which, combined with the speculars make this figure look AWESOME. 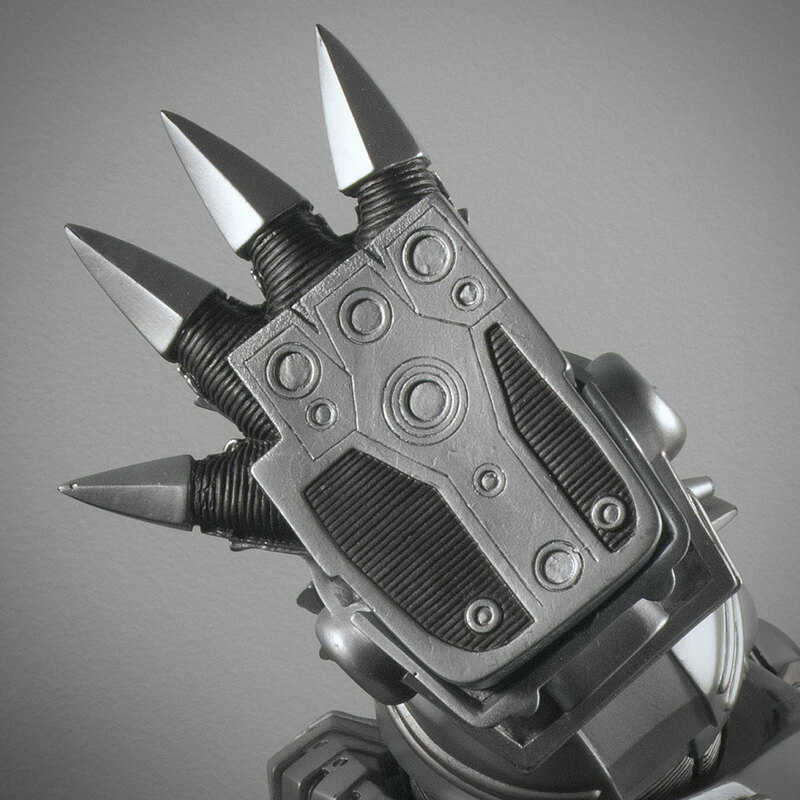 The ‘fiber’ surfaces lurking beneath Kiryu’s armor at all of his joints (waist, thighs, knees, tail segments, etc.) were given a lot of loving attention. 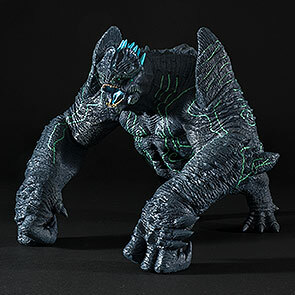 After being covered with a base coat of black, all of the elevated fibers and lines in the sculpt were brushed over with a dark silver to create a visual texture on top of the one in the sculpt. OUTSTANDING! 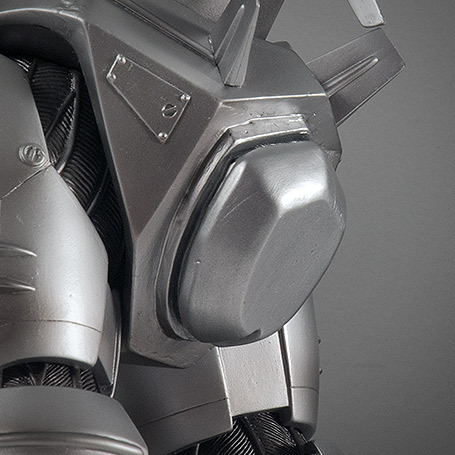 The figure also has a few extra colorful details such as markings and emblems. The “warpaint” arrows on both cheeks are overly hand-rendered and splotchy unlike the perfect red triangles on his arms and knees and the MFS-3 logo on his chest. I started this X-Plus review site to try to help spread the word on this great line of vinyl figures, not to complain or point out flaws. But another reason I started this site was to provide the kind of information I was seeking when I first discovered these figures. And since this figure has a hefty price tag, I feel the need to go on a little mini rant about the lack of quality my figure seems to have received on the assembly line. 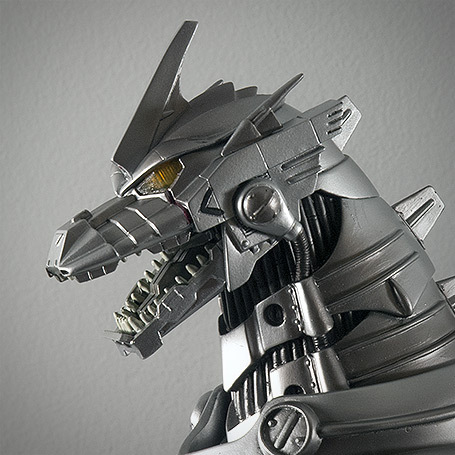 The jaw on my Kiryu figure leans to one side and is very obvious when viewing it from the front. I tried to nudge it back into position but it’s been glued in and wants to stay where it is. Same deal with the neck. The factory folk glued the bottom of the neck in on a slight angle and his head kind of tilts to his left. On the bright side, both of these are not noticeable from the side view. Also on my figure, the three doors which lead to the Triple Masers buried in the chest is one piece… and was glued on crooked enough to bug me. But the left shoulder is the worst offender. Over the left upper arm is a dome shaped shoulder piece… and it was glued on crooked. Now this is one flaw that’s highly visible. Finally, after attaching the tail on my figure I noticed right away that it swoops down LOWER than the plane the feet are meant to stand on. Either that, or, the lower legs were glued to the knees improperly. Bottom line, when I place my figure on the shelf, the tail pushes the figure up slightly so that its heels are off the ground. This force also pulls slightly at the tail joint and there’s a sliver of a gap on the bottom. All of these problems were on the particular figure that I received. That’s no guarantee that if you get this figure that yours will be the same way. Reviewer Rich Eso has reported that his Ric Boy version is perfect. I still felt the need to mention these problems to alert you that should you go after this figure you’d be playing a game of X-Plus Roulette. I also want to point out that, despite all of these flaws, this figure is still AMAZING and if I had the chance to buy it again, I would. Collector James Martinez originally posted these photos of his new Kiryu figure at the X-Plus Kaiju Collectors Facebook Page showing how numerous fins were significantly curved out of shape. Luckily, for me, my figure did not have this problem anywhere near to this extent. But while I was untying the wires in the back of the plastic shell which the figure ships in, I could see what happened to James’ figure. The fins were touching the shell as there wasn’t enough room left for them. Still, not bad though for a figure with over 60 small, thin fins on the back and tail. I’m just glad they were able to make this figure in vinyl. It all worked out in the end for James, though. He heated them with a hair dryer and nudged them back into their intended shape. 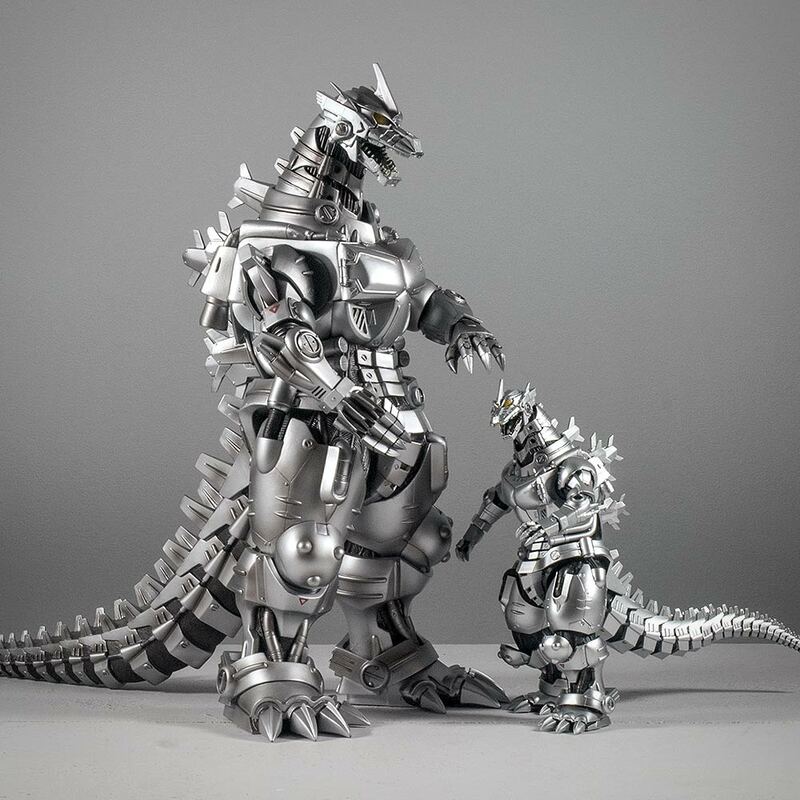 If you have yet to get your first 30cm Series X-Plus figure, knowing that it’s 12.5 inches helps but doesn’t really illustrate its size. 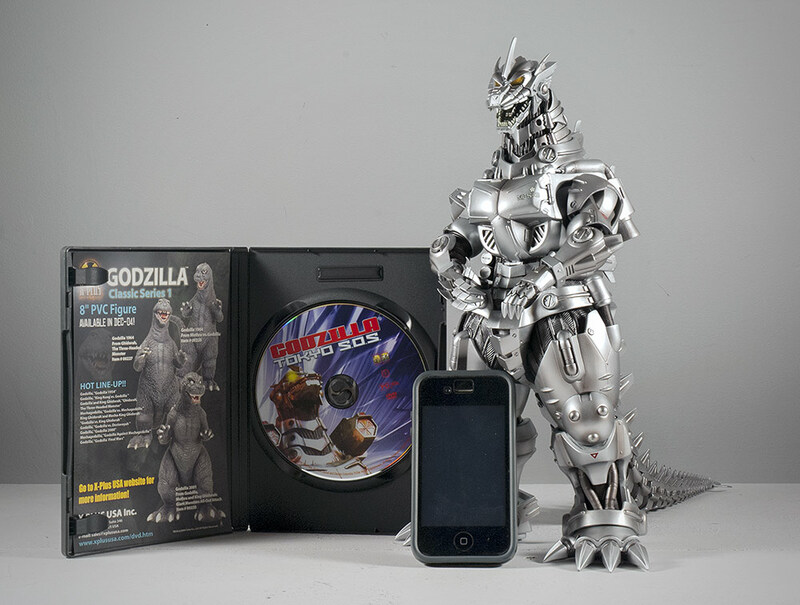 The photo on the left shows the Kiryu vinyl beside a DVD and iPhone for a sense of scale. And on the right a photo for those collectors who think their S.H. 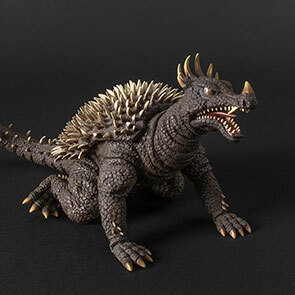 Monsterarts Kiryu is enough Kiryu for one collection. It’s 13.75 inches long yet isn’t much of a hog on the shelf. Placed at an angle, the tail easily slips behind its nearest neighbor. • Link to Kiryu Ric Boy Version on X-Plus Site. 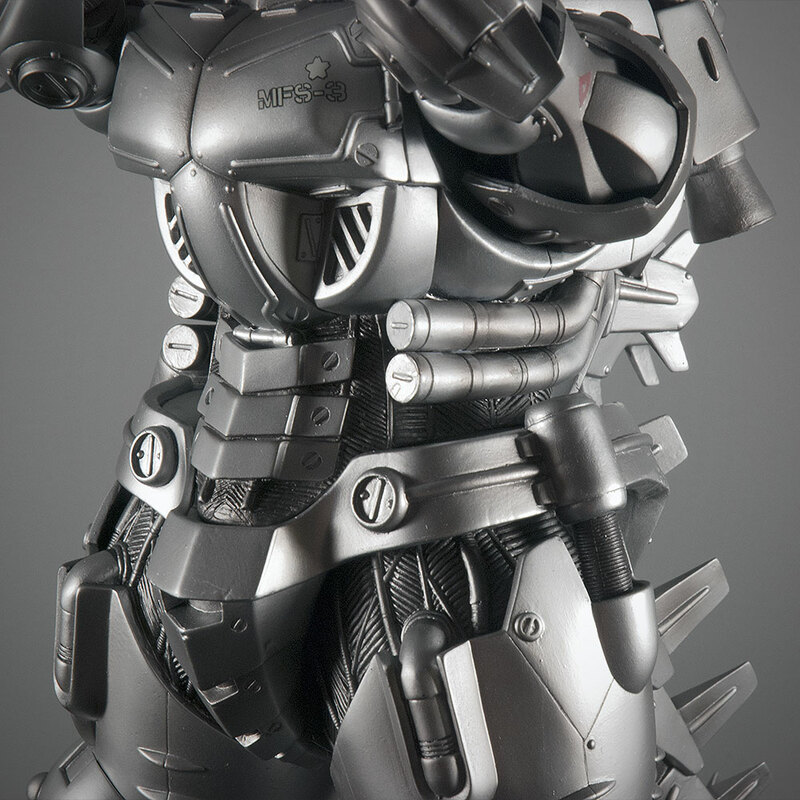 • High Resolution Photos of X-Plus Kiryu Standard and Ric Boy editions at Scifi Japan. • Rich Eso’s Video Review of the Ric Boy X-Plus Kiryu. This has to be one of the best reviews on the whole site John. Really well done. Lots of good details pointed out from pros and cons. This figure is really a standout piece of FRESH VINYL! 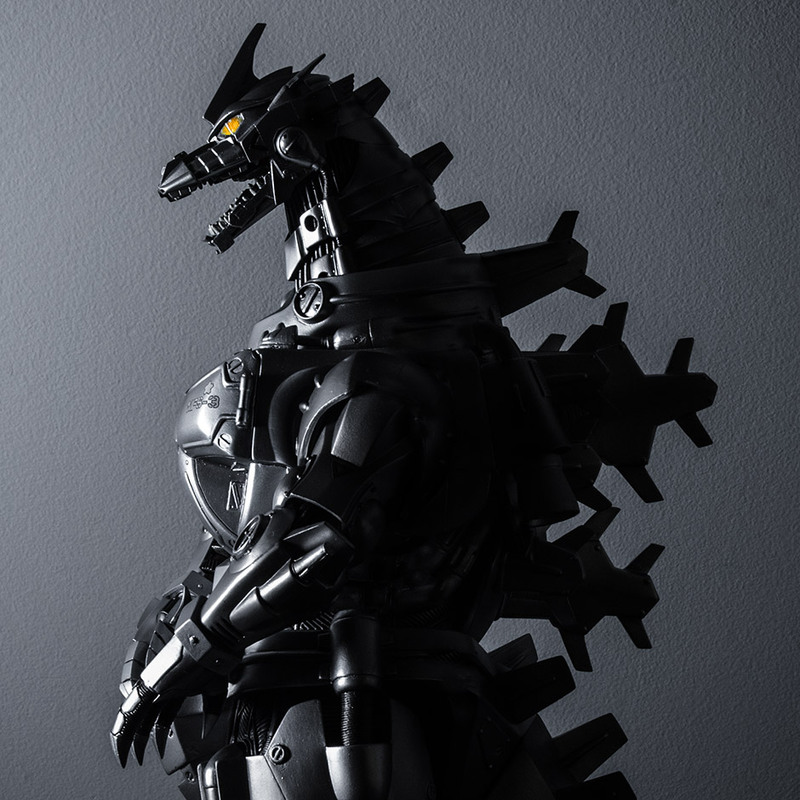 Even with some of its minor flaws, Kiryu is still amazingly done and X-Plus does not disappoint. Great review and thank you for the mentions as always! We’ll said Rich! Awesome review John and these pics look amazing! 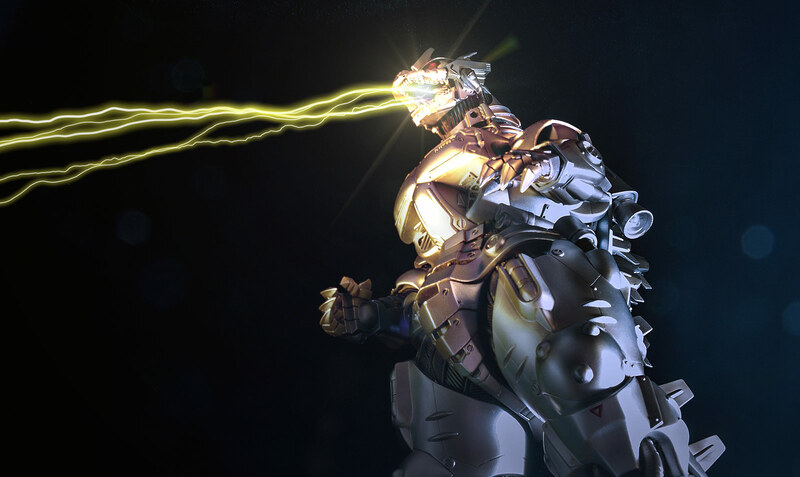 Love the pic with the mazer shooting out of Kiryu’s mouth! !